iv. Satan's bibles attack the deity of Jesus Christ. a. 1Ti 3:16 (KJV) - And without controversy great is the mystery of godliness: God was manifest in the flesh, justified in the Spirit, seen of angels, preached unto the Gentiles, believed on in the world, received up into glory. (ii)	(NIV) - Beyond all question, the mystery from which true godliness springs is great: He appeared in the flesh, was vindicated by the Spirit, was seen by angels, was preached among the nations, was believed on in the world, was taken up in glory. (iii)	(ESV) - Great indeed, we confess, is the mystery of godliness: He was manifested in the flesh, vindicated by the Spirit, seen by angels, proclaimed among the nations, believed on in the world, taken up in glory. (iv)	(NASB) - By common confession, great is the mystery of godliness: He who was revealed in the flesh, Was vindicated in the Spirit, Seen by angels, Proclaimed among the nations, Believed on in the world, Taken up in glory. (v)	(NLT) - Without question, this is the great mystery of our faith: Christ was revealed in a human body and vindicated by the Spirit. He was seen by angels and announced to the nations. He was believed in throughout the world and taken to heaven in glory. (vi)	(MSG) - This Christian life is a great mystery, far exceeding our understanding, but some things are clear enough: He appeared in a human body, was proved right by the invisible Spirit, was seen by angels. He was proclaimed among all kinds of peoples, believed in all over the world, taken up into heavenly glory. (ii)	(NIV) - and to make plain to everyone the administration of this mystery, which for ages past was kept hidden in God, who created all things. (v)	(NLT) - I was chosen to explain to everyone[a] this mysterious plan that God, the Creator of all things, had kept secret from the beginning. (vi)	(MSG) - My task is to bring out in the open and make plain what God, who created all this in the first place, has been doing in secret and behind the scenes all along. (v)	(NLT) - Though he was God, he did not think of equality with God as something to cling to. (vi)	(MSG) - He had equal status with God but didn’t think so much of himself that he had to cling to the advantages of that status no matter what. d.	1Jo 3:16 (KJV) - Hereby perceive we the love of God, because he laid down his life for us: and we ought to lay down our lives for the brethren. (i)	(NKJV) - By this we know love, because He laid down His life for us. And we also ought to lay down our lives for the brethren. (ii)	(NIV) - This is how we know what love is: Jesus Christ laid down his life for us. And we ought to lay down our lives for our brothers and sisters. (iii)	(ESV) - By this we know love, that he laid down his life for us, and we ought to lay down our lives for the brothers. (iv)	(NASB) - We know love by this, that He laid down His life for us; and we ought to lay down our lives for the brethren. (v)	(NLT) - We know what real love is because Jesus gave up his life for us. So we also ought to give up our lives for our brothers and sisters. (vi)	(MSG) - This is how we’ve come to understand and experience love: Christ sacrificed his life for us. This is why we ought to live sacrificially for our fellow believers, and not just be out for ourselves. e.	Rev 1:11 (KJV) - Saying, I am Alpha and Omega, the first and the last: and, What thou seest, write in a book, and send it unto the seven churches which are in Asia; unto Ephesus, and unto Smyrna, and unto Pergamos, and unto Thyatira, and unto Sardis, and unto Philadelphia, and unto Laodicea. f.	Mat 20:20 (KJV) - Then came to him the mother of Zebedee's children with her sons, worshipping him, and desiring a certain thing of him. (i)	(NKJV) - Then the mother of Zebedee’s sons came to Him with her sons, kneeling down and asking something from Him. (ii)	(NIV) - Then the mother of Zebedee’s sons came to Jesus with her sons and, kneeling down, asked a favor of him. (iii)	(ESV) - Then the mother of the sons of Zebedee came up to him with her sons, and kneeling before him she asked him for something. (iv)	(NASB) - Then the mother of the sons of Zebedee came to Jesus with her sons, bowing down and making a request of Him. (v)	(NLT) - Then the mother of James and John, the sons of Zebedee, came to Jesus with her sons. She knelt respectfully to ask a favor. (vi)	(MSG) - It was about that time that the mother of the Zebedee brothers came with her two sons and knelt before Jesus with a request. g.	Rom 14:10-12 (KJV) - But why dost thou judge thy brother? or why dost thou set at nought thy brother? for we shall all stand before the judgment seat of Christ. 11) For it is written, As I live, saith the Lord, every knee shall bow to me, and every tongue shall confess to God. 12) So then every one of us shall give account of himself to God. (ii)	(NIV) - You, then, why do you judge your brother or sister? Or why do you treat them with contempt? For we will all stand before God’s judgment seat. 11) It is written: “‘As surely as I live,’ says the Lord, ‘every knee will bow before me; every tongue will acknowledge God.’” 12) So then, each of us will give an account of ourselves to God. (iii)	(ESV) - Why do you pass judgment on your brother? Or you, why do you despise your brother? For we will all stand before the judgment seat of God; 11) for it is written, “As I live, says the Lord, every knee shall bow to me, and every tongue shall confess to God. 12) So then each of us will give an account of himself to God. (iv)	(NASB) - But you, why do you judge your brother? Or you again, why do you regard your brother with contempt? For we will all stand before the judgment seat of God. 11) For it is written, “As I live, says the Lord, every knee shall bow to Me, And every tongue shall give praise to God.” 12) So then each one of us will give an account of himself to God. (v)	(NLT) - So why do you condemn another believer? Why do you look down on another believer? Remember, we will all stand before the judgment seat of God. 11) For the Scriptures say, “‘As surely as I live,’ says the Lord, ‘every knee will bend to me, and every tongue will declare allegiance to God.’” 12) Yes, each of us will give a personal account to God. (vi)	(MSG) - So where does that leave you when you criticize a brother? And where does that leave you when you condescend to a sister? I’d say it leaves you looking pretty silly—or worse. Eventually, we’re all going to end up kneeling side by side in the place of judgment, facing God. Your critical and condescending ways aren’t going to improve your position there one bit. Read it for yourself in Scripture: “As I live and breathe,” God says, “every knee will bow before me; Every tongue will tell the honest truth that I and only I am God.” So tend to your knitting. You’ve got your hands full just taking care of your own life before God. v.	Satan's bibles attack the sonship of Jesus Christ. a. The NASB, one of Satan's most popular bibles, teaches that Jesus is a begotten God (which is no God at all). His other bibles change the description of Jesus as the only begotten Son of God. (i)	Joh 1:18 (KJV) - No man hath seen God at any time, the only begotten Son, which is in the bosom of the Father, he hath declared him. 2. (NIV) - No one has ever seen God, but the one and only Son, who is himself God and is in closest relationship with the Father, has made him known. 3. (ESV) - No one has ever seen God; the only God, who is at the Father's side, he has made him known. 4. (NASB) - No one has seen God at any time; the only begotten God who is in the bosom of the Father, He has explained Him. 5. (NLT) - No one has ever seen God. But the unique One, who is himself God, is near to the Father’s heart. He has revealed God to us. 6. (MSG) - No one has ever seen God, not so much as a glimpse. This one-of-a-kind God-Expression, who exists at the very heart of the Father, has made him plain as day. b. Many of Satan's bibles remove references to Jesus being the Son of God. (i)	Act 3:26 (KJV) - Unto you first God, having raised up his Son Jesus, sent him to bless you, in turning away every one of you from his iniquities. 2. (NIV) - Indeed Herod and Pontius Pilate met together with the Gentiles and the people of Israel in this city to conspire against your holy servant Jesus, whom you anointed. 5. (NLT) - “In fact, this has happened here in this very city! For Herod Antipas, Pontius Pilate the governor, the Gentiles, and the people of Israel were all united against Jesus, your holy servant, whom you anointed. 6. (MSG) - “For in fact they did meet—Herod and Pontius Pilate with nations and peoples, even Israel itself!—met in this very city to plot against your holy Son Jesus, the One you made Messiah, to carry out the plans you long ago set in motion. 7. It's a sad day for the NIV, ESV, NASB, and NLT when The Message is more accurate than they are in these verses. (iii)	Act 4:30 (KJV) - By stretching forth thine hand to heal; and that signs and wonders may be done by the name of thy holy child Jesus. (iv)	A son is far superior to a servant (Joh 8:35). vi. Satan's bibles attack the resurrection of Christ. (ii)	(NIV) - After his suffering, he presented himself to them and gave many convincing proofs that he was alive. He appeared to them over a period of forty days and spoke about the kingdom of God. (iii)	(ESV) - He presented himself alive to them after his suffering by many proofs, appearing to them during forty days and speaking about the kingdom of God. (iv)	(NASB) - To these He also presented Himself alive after His suffering, by many convincing proofs, appearing to them over a period of forty days and speaking of the things concerning the kingdom of God. (v)	(NLT) - During the forty days after he suffered and died, he appeared to the apostles from time to time, and he proved to them in many ways that he was actually alive. And he talked to them about the Kingdom of God. (vi)	(MSG) - After his death, he presented himself alive to them in many different settings over a period of forty days. In face-to-face meetings, he talked to them about things concerning the kingdom of God. d.	There is a big difference between infallible proofs and convincing proofs. vii. Satan's bibles make Jesus Christ a sinner. a.	Mat 5:22 (KJV) - But I say unto you, That whosoever is angry with his brother without a cause shall be in danger of the judgment: and whosoever shall say to his brother, Raca, shall be in danger of the council: but whosoever shall say, Thou fool, shall be in danger of hell fire. (ii)	(NIV) - But I tell you that anyone who is angry with a brother or sister will be subject to judgment. Again, anyone who says to a brother or sister, ‘Raca,’ is answerable to the court. And anyone who says, ‘You fool!’ will be in danger of the fire of hell. (iii)	(ESV) - But I say to you that everyone who is angry with his brother will be liable to judgment; whoever insults his brother will be liable to the council; and whoever says, ‘You fool!’ will be liable to the hell of fire. (iv)	(NASB) - But I say to you that everyone who is angry with his brother shall be guilty before the court; and whoever says to his brother, ‘You good-for-nothing,’ shall be guilty before the supreme court; and whoever says, ‘You fool,’ shall be guilty enough to go into the fiery hell. (v)	(NLT) - But I say, if you are even angry with someone, you are subject to judgment! If you call someone an idiot, you are in danger of being brought before the court. And if you curse someone, you are in danger of the fires of hell. (vi)	(MSG) - I’m telling you that anyone who is so much as angry with a brother or sister is guilty of murder. Carelessly call a brother ‘idiot!’ and you just might find yourself hauled into court. Thoughtlessly yell ‘stupid!’ at a sister and you are on the brink of hellfire. The simple moral fact is that words kill. b. We can be angry without sinning (Eph 4:26). c.	Jesus was angry with people with a cause (Mat 21:12; Joh 2:15; Mar 3:5). 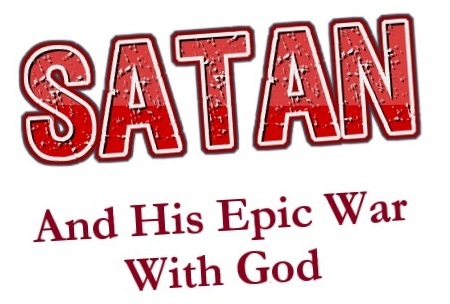 d.	Satan's bibles make Jesus a sinner. viii. Satan's bibles take away Christ's sovereignty in salvation. (ii)	(NIV) - ... After he had provided purification for sins, he sat down at the right hand of the Majesty in heaven. (v)	(NLT) - ... When he had cleansed us from our sins, he sat down in the place of honor at the right hand of the majestic God in heaven. (vi)	(MSG) - ... After he finished the sacrifice for sins, the Son took his honored place high in the heavens right alongside God, far higher than any angel in rank and rule. b. 1Co 1:18 (KJV) - For the preaching of the cross is to them that perish foolishness; but unto us which are saved it is the power of God. (i)	(NKJV) - For the [a]message of the cross is foolishness to those who are perishing, but to us who are being saved it is the power of God. (ii)	(NIV) - For the message of the cross is foolishness to those who are perishing, but to us who are being saved it is the power of God. (iii)	(ESV) - For the word of the cross is folly to those who are perishing, but to us who are being saved it is the power of God. (iv)	(NASB) - For the word of the cross is foolishness to those who are perishing, but to us who are being saved it is the power of God. (v)	(NLT) - The message of the cross is foolish to those who are headed for destruction! But we who are being saved know it is the very power of God. (vi)	(MSG) - The Message that points to Christ on the Cross seems like sheer silliness to those hellbent on destruction, but for those on the way of salvation it makes perfect sense. (i)	(NKJV) - For we are to God the fragrance of Christ among those who are being saved and among those who are perishing. (ii)	(NIV) - For we are to God the pleasing aroma of Christ among those who are being saved and those who are perishing. (v)	(NLT) - Our lives are a Christ-like fragrance rising up to God. But this fragrance is perceived differently by those who are being saved and by those who are perishing. (vi)	(MSG) - Through us, he brings knowledge of Christ. Everywhere we go, people breathe in the exquisite fragrance. Because of Christ, we give off a sweet scent rising to God, which is recognized by those on the way of salvation—an aroma redolent with life. But those on the way to destruction treat us more like the stench from a rotting corpse. d.	Gal 2:16 (KJV) - Knowing that a man is not justified by the works of the law, but by the faith of Jesus Christ, even we have believed in Jesus Christ, that we might be justified by the faith of Christ, and not by the works of the law: for by the works of the law shall no flesh be justified. (i)	(NKJV) - knowing that a man is not [a]justified by the works of the law but by faith in Jesus Christ, even we have believed in Christ Jesus, that we might be justified by faith in Christ and not by the works of the law; for by the works of the law no flesh shall be justified. (ii)	(NIV) - know that a person is not justified by the works of the law, but by faith in Jesus Christ. So we, too, have put our faith in Christ Jesus that we may be justified by faith in Christ and not by the works of the law, because by the works of the law no one will be justified. (iii)	(ESV) - yet we know that a person is not justified by works of the law but through faith in Jesus Christ, so we also have believed in Christ Jesus, in order to be justified by faith in Christ and not by works of the law, because by works of the law no one will be justified. (iv)	(NASB) - nevertheless knowing that a man is not justified by the works of the Law but through faith in Christ Jesus, even we have believed in Christ Jesus, so that we may be justified by faith in Christ and not by the works of [b]the Law; since by the works of the Law no flesh will be justified. (vi)	(MSG) - We know very well that we are not set right with God by rule-keeping but only through personal faith in Jesus Christ. How do we know? We tried it—and we had the best system of rules the world has ever seen! Convinced that no human being can please God by self-improvement, we believed in Jesus as the Messiah so that we might be set right before God by trusting in the Messiah, not by trying to be good. e.	Gal 2:20 (KJV) - I am crucified with Christ: nevertheless I live; yet not I, but Christ liveth in me: and the life which I now live in the flesh I live by the faith of the Son of God, who loved me, and gave himself for me. (i)	(NKJV) - I have been crucified with Christ; it is no longer I who live, but Christ lives in me; and the life which I now live in the flesh I live by faith in the Son of God, who loved me and gave Himself for me. (ii)	(NIV) - I have been crucified with Christ and I no longer live, but Christ lives in me. The life I now live in the body, I live by faith in the Son of God, who loved me and gave himself for me. (iii)	(ESV) - I have been crucified with Christ. It is no longer I who live, but Christ who lives in me. And the life I now live in the flesh I live by faith in the Son of God, who loved me and gave himself for me. (iv)	(NASB) - I have been crucified with Christ; and it is no longer I who live, but Christ lives in me; and the life which I now live in the flesh I live by faith in the Son of God, who loved me and gave Himself up for me. (v)	(NLT) - My old self has been crucified with Christ. [a] It is no longer I who live, but Christ lives in me. So I live in this earthly body by trusting in the Son of God, who loved me and gave himself for me. (vi)	(MSG) - Indeed, I have been crucified with Christ. My ego is no longer central. It is no longer important that I appear righteous before you or have your good opinion, and I am no longer driven to impress God. Christ lives in me. The life you see me living is not “mine,” but it is lived by faith in the Son of God, who loved me and gave himself for me.